Here are some of our recent CBT Dublin testimonials, some names have been withheld to protect our clients request for confidentiality. When Clare left her office in December 2016 I had already been for a few sessions for my anxiety. 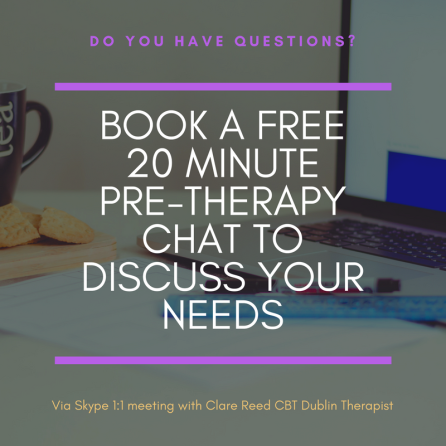 I moved over to the Skype sessions easily and loved the fact that I was at home and didn't have to drive an hour home after the sessions, which I had been doing! I think the technology is amazing, having worked with the loose worksheets from the office sessions to having them organised in front of me on the screen was a real help. Keep up the good work! Our last appointment was one year ago this month! I cannot begin to express my gratitude for what you did for me. My life is truly different after working with you. My anxiety is manageable to the point of non existant. I have had only one panic attack in a year and it occurred after something reasonable enough to be very upset over. Most of all I understand anxiety now as a process and I am able to work through my issues with all the tools you gave me. I am able to dismiss minor things very easily and anything that pushes me a little more I write down in my journal and work through. My life is so much easier to live now and everyone around me even says they see a huge change. I now have a great job and I did well in my masters and got a first in my dissertation. I've been with my girlfriend for almost a year now! Even my relationship with her is completely different to any previous relationships because I am better able to manage my anxiety. I am so sorry it took me so long to email and thank you but I am delighted to be able to give you such a happy report one year on. Working with you changed me completely and I love my life so much more now. Thank you from the absolute bottom of my heart for everything. I hope you're well and I continue to tell anyone I ever meet about you and the impact CBT has had on my life.